Stringent requirements are imposed as regards the reliability and electrical safety of power supplies for medical locations or other sensitive applications, such as production equipment, office buildings and computing centres. In order to gain a fast and thorough overview of the electrical installation, the new gateway COM460IP is used as Ethernet gateway with web server. The familiar functions of the basic device and the four option packs have been considerably enhanced by this update. In addition to the alarm list, the basic version of COM460IP version 3.0 now additionally provides a history with previous alarm entries and 12 data loggers which record the measured values of the connected devices. The option pack D has been improved too. Option pack D enables fast, clear and simple visualisation of the entire system without requiring special programming skills to set it up. It takes very little effort to create the visualisation and learning how to use it is very intuitive. This tool means that the system view can be adapted to a wide range of situations or users. The new features of version 3.0: Option D represents both the COM460IP's own data logger values and the new data logger values in one chart. This provides a brief overview making analysis easier. The configuration menus of visualisation have been improved enabling the user to navigate quickly and easily. In addition to the familiar visualisation, one page can be displayed with an overview of several COM460IP gateways. The icons signal a common alarm of the respective system and forward it to the web server. Option pack A provides the possibility to assign individual texts to devices and measuring points as well as to individual measuring channels. This means that the system view can be adapted to the relevant situation or the respective user. It is also now possible to send e-mail notifications for alarms and system faults to different user groups. In version 3.0, the configuration has been simplified and improved. Now it is possible to use several e-mail servers to guarantee reliable alarm signalling. The e-mail dispatch can also be adapted to the relevant application situation. In terms of timings and with respect to recipient groups there are a wide range of settings options. The software also allows activation of device failure monitoring. 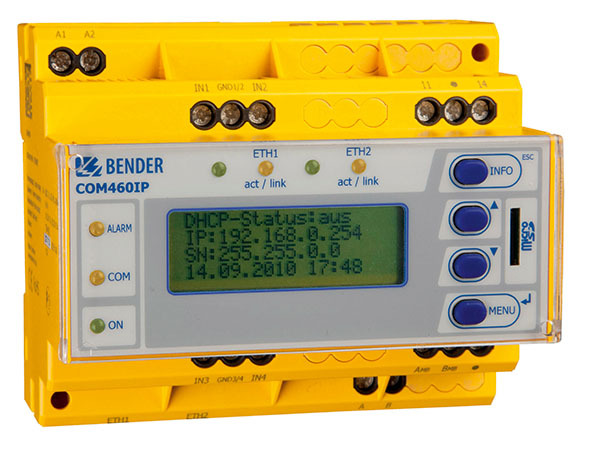 Other new option packs are Option B and Option C. Option B extends the Modbus functionality of the basic device to all devices connected to the bus and Option C makes it possible to parameterise the connected Bender devices. And, of course, using the new and improved functions does not mean buying a new device. All COM460IP devices can be upgraded with the new options. The latest software including all options is available on the Bender homepage. This software is then transferred to the COM460IP based on a menu-based system. All the new features are active immediately, depending on the option licences in place. This means the latest software is always available free of charge. Any missing licences can be added at any time. The licence key is available on the Bender homepage and is transferred to the COM460IP via a menu system. All software options can be combined. The same applies to future Options.